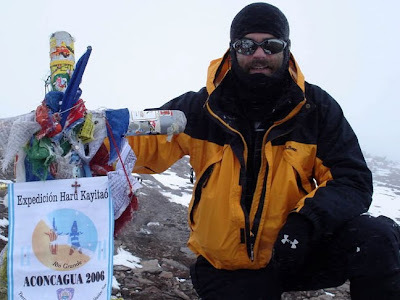 On January 20th 2006, I completed a life long dream to climb one of the world’s seven summits. These peaks, coveted by mountaineers around the world, include the highest spots on each continent. A listing can be found here. At 22,843 feet Aconcagua located on the Argentina/Chile border is the highest peak in the western hemisphere. If you want to be any closer to God, you need to drag yourself to the Himalaya. Reaching the 4 year anniversary of that climb, I find myself reflecting on the trip and contemplating a future return to the mountains. As I think about the momentous experience and the impact it has had on my life, I wanted to share a few of my favorite photos from that trip. 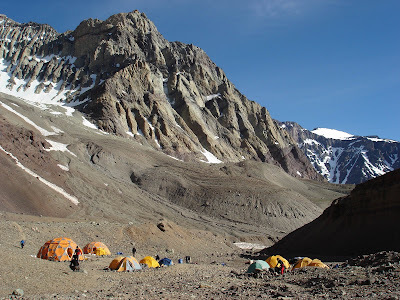 In order photos depict: Base Camp, Camp 2, Camp 3 w/Aconcagua in the Background, Camp 3, Leaving Camp 3 for Camp 4, Camp 4 and Summit of Aconcagua. That is some impressive scenery! You should re-publish some of your writings from this trip... would love to read more about it. Great pics too!